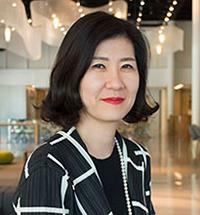 Jooyoung Shin is an Assistant Professor in the department of Fiber Science and Apparel Design at the College of Human Ecology of Cornell University. Professor Shin has explored diverse areas in the fashion fields as a designer, curator, fashion historian, researcher, and educator. She graduated from Rhode Island School of Design, Apparel Design with honor; completed her M.A. in museum studies, with a specialization in costume and textiles at Fashion Institute of Technology in the USA; and earned her Ph.D. in aesthetics in dress at Seoul National University in Korea. She worked at the Costume Institute and the Antonio Ratti Textile Center at the Metropolitan Museum of Art and at Ewha Womans University Museum performing various duties, such as assisting with the organization of fashion exhibitions, managing the storage of historic textiles, and conservation work on excavated clothing from the 17th century. Professor Shin began her career as a fashion design educator during her doctoral coursework and has taught a wide range of subjects related to fashion (design, history, aesthetics, and culture) since 2003. Prior to her appointment at Cornell University in 2016, she taught fashion design at the Institute of Textiles and Clothing (ITC) at the Hong Kong Polytechnic University. Professor Shin has conducted research on various subjects, such as Sally Milgrim who was an important fashion legend forgotten in the history of American fashion; chinoiserie fashion in the 18th century; the relationship between fashion and art from the perspective of both the fashion designer and the artist; and the concept of ideal beauty and its relationship with the form and content of dress explored through her doctoral dissertation. As an extension of this research subject, she continued to investigate the cultural differences deeply rooted in dress and the origins of these differences, focusing on the eastern and western perspectives on the body and dress and completed a study of Olympic parade uniforms, which identified how national identity is visually embodied in this special set of clothing as well as how design elements denote the cultural and geographical differences. With her research projects, she strives to trace the remarkably different perception of fashion back in history or between contemporary cultures. Another research project called “Development of Sustainable Practice in Fashion Industry” began by questioning why the fashion industry appears to relatively behind in addressing its environmental footprint and other sustainability issues, despite the fact that awareness about ethical/eco-friendly fashion has grown exponentially in recent years. The project was funded by University Grants Council (UGC) of Hong Kong with a total amount of HK$314,159 in 2012. Recently she embarked on a new researh project which aims to identify the relashionship between creativity and acculuraton in the context of fashion design process, based upon an intensive study of the works of fashion designers and students who have bicultural values. Currently I am working on a research project entitled “Mistaken Identity: Crosscultural Appropriation in Contemporary Fashion.” In this study I will explore the concept of cross-cultural appropriation and define its spectrum in the field of fashion design through an in-depth analysis of both the recent controversial examples and examine issues of diversity that have long been ignored or overlooked in the fashion industry through the lens of cross-cultural appropriation. This project is funded by the President’s Council of Cornell Women (PCCW) Affinito-Stewart Grant. In addition to her academic work, Professor Shin is a lifelong designer of fashion and has continued to participate in a number of international fashion art exhibitions and had two solo exhibitions; Strips of History in 2008, which brilliantly embodied her passion for design and profound knowledge for fashion history, and Five Phases: Endless Cycle of Creation and Destruction in 2012, which presented the best and the most appropriate ways to preserve and promote the beauty of cultural heritage for future generation. She participated in the Cheongsam Fashion Show, one of the cultural collaboration projects between Hong Kong and Taiwan which was organized by the Hong Kong Museum of History for “Hong Kong Week 2013” at Taipei to celebrate the opening of the exhibition A Century of Fashion: Hong Kong Cheongsam Story. In October 2014 she was invited to create one fashion artwork for the exhibition at Chung Young Yang Embroidery Museum (CEM) in Korea. Invited artists are asked to select one or more objects from the museum collection and to express their own inspiration drawn from it through any form of artwork. She won 2016 ITAA Award for Design Scholarship at the 2016 ITAA Annual Conference in Vancouver, British Columbia, Canada. Since my appointment at Cornell University in 2016, one of my major accomplishments was the development of my solo exhibition titled “Dress and Body: Oneness or Duality?.” This representation of my creative work consisting of twelve garments was born from a research project examining the physical and conceptual relationship between dress and body in various socio-cultural contexts. Shin, J. Sally Milgrim: A Pioneer of American Fashion, 1920–1935, Dress 44 (2): 83-104. Chan, C.K., Shin, J. and Jiang, S.X.K. (2018). Development of Tailor-Shaped Bacterial Cellulose Textile Cultivation Techniques for Zero-Waste Design, Clothing and Textile Research Journal, 36(1): 33-44. Shin, J. (2014). Clad with National Identity: Parade Uniforms of the Olympic Games, International Journal of Fashion Design, Technology and Education, 7(3): 208-244. Gong, L. & Shin, J. (2013). The Innovative Application of Surface Texture in Fashion and Textile Design. Fashion and Textile Research Journal. 15(3):. 1-11. Shin, J. (2012). Formative Representation of Sensuality in 19th Century Fashion. Research Journal of Textile and Apparel. 16(4): 59-70. Shin, J. & Kim, M.J. (2008). The Development of Perspectives for Viewing the Aesthetics of Costume. Journals of the Korean Society of Costume. 58(87): 76-91. Shin, J. (2008). An Analysis of Ideal Beauty Represented in Dress from the Renaissance to Baroque Periods. Journals of the Korean Society of Costume. 58(3): 131-148. Shin, J.Y. & Kim, M.J. (2006). Chinoiserie in the Eighteenth Century Rococo Fashion, Journals of the Korean Society of Costume. 56(1): 13-31. Lee, K.J., Chang, S.H. & Hong, N.Y. (2005). Traditional Korean Costume. Kent: Global Oriental Ltd.
Ewha Woman’s University. (2004). Korean Traditional Furniture. Seoul: Ewha Womans University Press. Ewha Woman’s University. (2004). Norigae: The Beautiful Pendants of Korea. Seoul: Ewha Womans University Press. Five Phases: Endless Cycle of Creation and Destruction (21-25 Jun 2012, Inno Centre, Hong Kong and 3 Sep-11 Oct 2013, The Fashion Gallery, The Hong Kong Polytechnic University). Fashion Group of Seoul National University (FOS) “Iconographic Corea” (Sep 2003, Seoul National University, Korea). 1. Encourage students to value the basics. It is my belief that a designer should know how to make clothes from the very first step with his or her own hands and that it is not possible to become one of the great masters of fashion design without thorough training in fashion technology skills. I always emphasize to my students that knowledge of fashion technology and skills are crucial for them to successfully execute their design ideas. 2. Ensure my students are armed with a wide range of knowledge and skills. I want my students to accumulate the fundamental and essential knowledge and skills which will be a strong foundation for their lifetime career. I encourage my students to absorb everything they see, hear, and learn, regardless of its relevance to their study, and save it an intellectual asset. First, I take the initiative to engage students in active research work by giving lectures using a wide range of visual, written, and multimedia references relevant to the subject. I strive to impart knowledge to them in order to facilitate students’ understanding of the subject, as well as to arouse their intellectual curiosity. Then I ask them to conduct various research activities, such as searching out references in the library or online, visit art galleries and museums, go shopping or watch movies, etc., to collect as much information as possible, regardless of the nature of their subjects or assignments. 3. Provide interactive teaching and learning environment for students. I believe communication and interaction are the most fundamental and effective vehicles that enable a teacher to transfer knowledge clearly to students and students to maximize the assimilation of what they learn. Regardless of course format, lecture- or studio-based, I strive to have as much as interaction as possible with my students and to engage them to take part actively during the lecture.